Whenever I teach freshmen or sophomores, I always begin the school year with a short story unit. 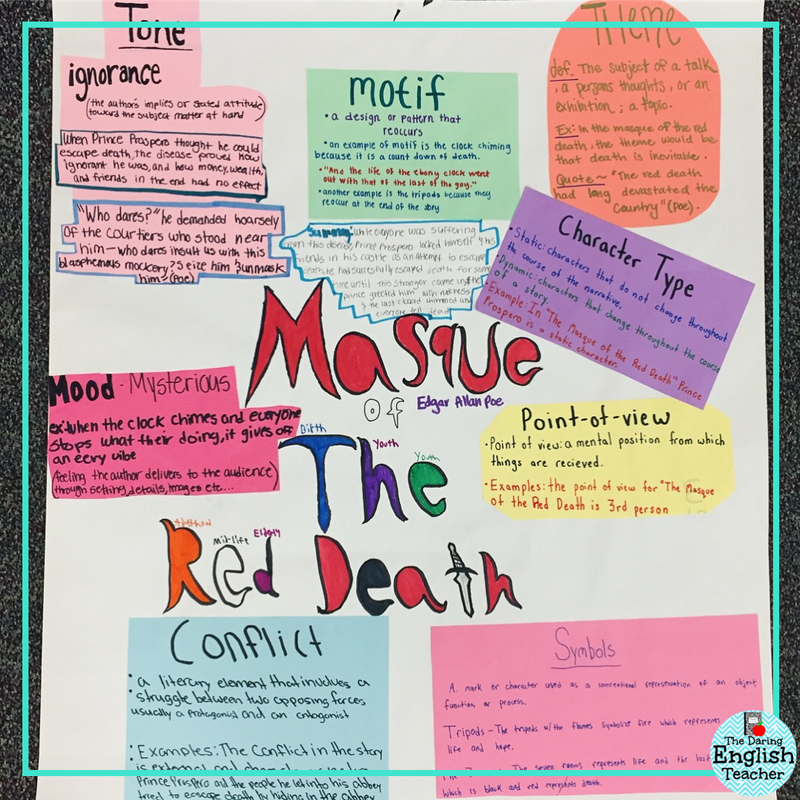 I use this unit to introduce literary elements to my students, and they start exploring literary analysis. I believe it is a perfect way to begin the school year. Toward the end of my short story unit, I assign my students a collaborative short story review poster project that takes two days. 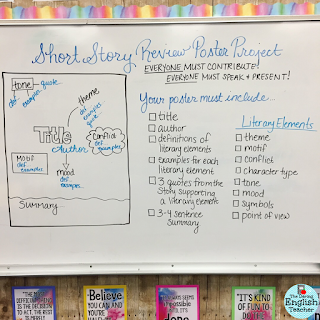 I use the poster project as a final review activity before our short story unit test and essay. And since I require each group of students to present their posters, it’s also a tremendously helpful review for the students. Students work together in groups of 4-5. As a requirement, I ask that everyone in the group contribute to the final project, and everyone must also speak and present. Since this is usually their first presentation of the school year, I feel that group presentations help ease students’ minds a bit. I provide my student groups with butcher paper for the poster, and I also supply them with colorful paper and markers. I have my students complete all of the work for this collaborative project in class. 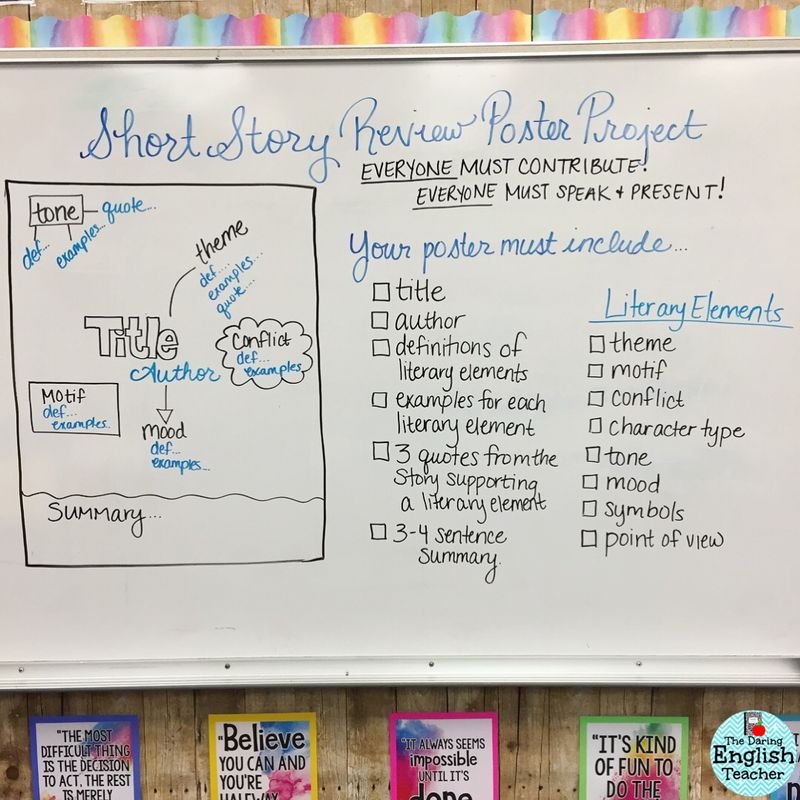 Each group creates a poster for a different short story we read together in class, and it is okay if there are duplicate groups. If I have duplicate groups, I usually have them spaced out across the room from one another. Each poster has the same requirements. Students must include the title and author of the short story. 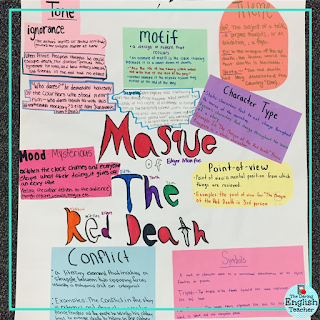 From there, students must also add the definition of each listed literary element as well as an example (in their own words) from the story. 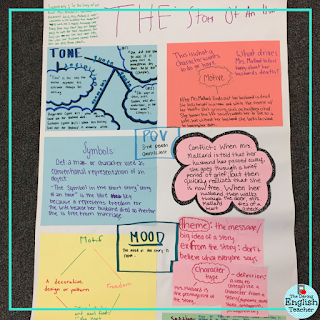 To support their examples, I have students find three quotes that demonstrate three different literary elements, and they also write a 3-4 sentence summary of the story. 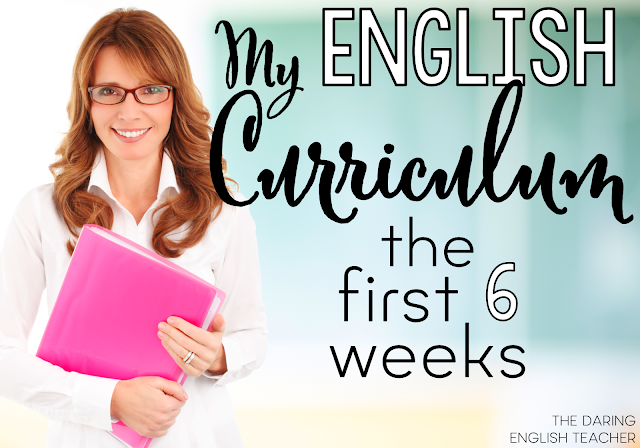 This project can easily take up more than two class periods (mine are 55 minutes each), so I emphasize to my students that this is meant to be a quick review. I also stress that I am looking for quality content on the poster rather than poster aesthetics. 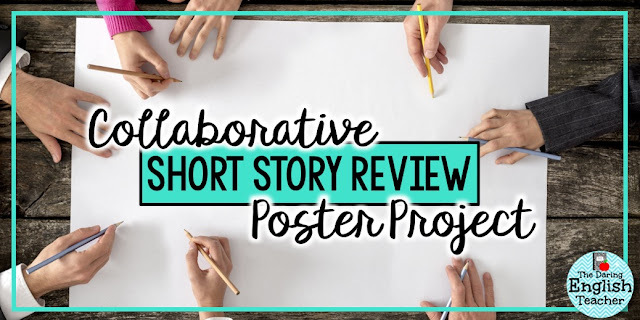 Typically, I spend about 10-15 minutes explaining the poster project and reviewing the guidelines with my students (and this also includes a quick discussion about my group work expectations since this activity usually takes place about one month after the start of the new school year). After that, they have the rest of the class period to work. On the second day of this project, I briefly review my expectations again and then give the students about 30 minutes to complete their posters. For the presentation, each group takes turns presenting their posters to the entire class. Once my students are finished presenting, I hang these posters on the walls as we work on our short story essay, which is usually a motif essay. 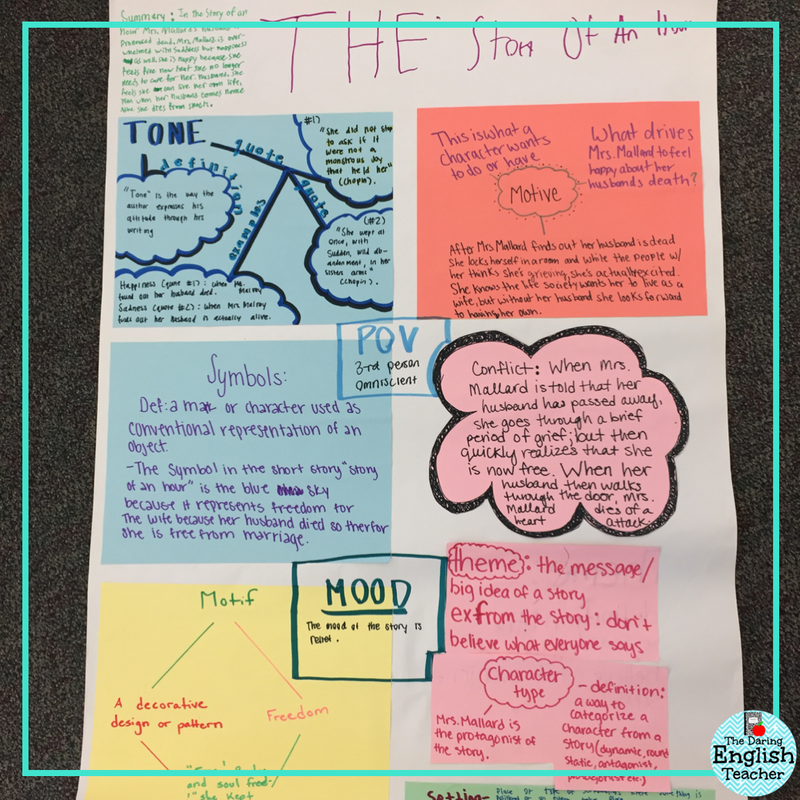 Displaying these posters on the walls helps my struggling students brainstorm quotes and ideas for their essays. One of the reasons why I love this project so much is that it is entirely student-centered. During these two days, my students are usually sprawled out in groups on the floor as they discuss the story and write about it.